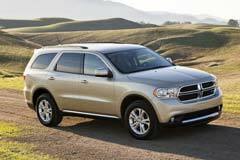 The Dodge Durango proved to be one of the most popular SUVs on the market. The first generation of Dodge Durango was introduced back in the year 1998. Since then, three generations of this vehicle were introduced in the market, each time with different modifications both from an exterior and an interior point of view. Needless to say changes were introduced as well in terms of its engine, performance and handling. If you are considering buying a used Dodge Durango you should take into account a number of considerations besides the condition and which year it was first bought. The later models, especially the Durango that was introduced in 2011, have much better reviews when it comes to their exterior design. They look more modern and stylish, and they also have a comfortable, spacious and practical interior. The former generations of the Durango come in four and five speed transmissions, whereas the later model also comes with a six-speed automatic transmission. 2016 Dodge Durango SXT 2016 Dodge Durango SXT Salvaged Extra Clean Damaged Rebuilder Won't Last L@@K!!! 2017 Dodge Durango Citadel Anodized Platinum AWD ADAPTIVE CRUISE CONTROL+2 BLU-RAY SCREENS+4 HEATED CAPTAIN'S CHAIRS+MORE!